Marvel has enjoyed such enormous success in its ground-breaking cinematic universe that it’s now confident enough to attempt to put even the smallest of its heroes on screen, both in terms of physical size and profile. Cue Ant-Man, a hero who shrinks to the size of an ant but retains all of his strength. Luckily he’s more like a soldier ant than a worker, otherwise it’d be two hours of him moving soil, one grain at a time. 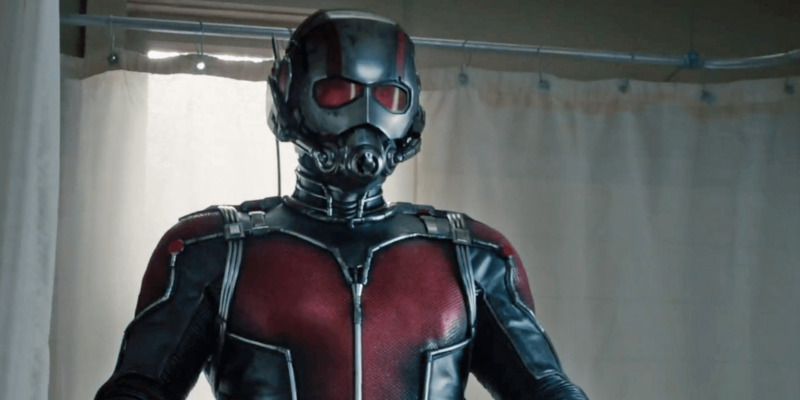 The man inside the suit is Scott Lang (Paul Rudd), a Robin Hood-style master criminal who’s recruited by the suit’s developer and original Ant-Man Hank Pym (Michael Douglas – not to be confused with the BBC’s Health Editor Hugh Pym) to prevent the creation of a similar suit by shady weapons developer Darren Cross (Corey Stoll). Ant-Man is far from an A-list superhero property, which is mercifully acknowledged in one or two scenes in the film, but this isn’t enough. With a comic book footnote like this the film-makers need to work harder to win us over and carve out a unique identity, as with Guardians of the Galaxy, but director Peyton Reed shies away from the challenge, instead staying well within the realms of the Marvel mould. There is a smattering of the humour we’ve come to expect in the MCU, but it all feels very stale, particularly Scott’s comedy ethnic friends, led by Michael Peña. And this is a feel that permeates the whole film, which, aside from the obvious differences necessitated by Ant-Man’s unique powers, feels interchangeable with any other solo Marvel film. Michael Douglas’s ageing scientist could easily be Thor’s Erik Selvig. Love interest Hope (Evangeline Lilly) could be Liv Tyler, Natalie Portman or Gwyneth Paltrow from any of their respective franchises. And the dynamic with the villain’s powers being essentially the hero’s in the wrong hands is identical to that of Iron Man, The Incredible Hulk, both Thor films and Captain America: The Winter Soldier. It’s the same old template made to fit a slightly different super power, and boy is it getting tired. And Ant-Man has the added disadvantage of being totally ridiculous. He’s up there with Aquaman for lousy superheroes. Seeing Paul Rudd learning to make ants push a sugar cube sure aint Jedi training on Dagobah. If you don’t already know and like Ant-Man, this film won’t win you over. Its strongest element is the action, with the nano-hero’s initial exploration of the world in his tiny form a particular highlight. This is the aspect of the film that feels the most fresh, and they do a nice job on the microscopic mêlées. There’s a good attention to detail here and it’s well-rendered, so there’s some reasonably entertaining stuff to get your mandibles into. But in spite of some supposedly sincere father/daughter relationships, it doesn’t pack the same punch on an emotional level. While it needed to be bold and original, this superhero flick plays it safe, resulting in something that can only be described as an anty-climax. Interesting take, enjoyed reading it. I think I liked the film more than you (by your review anyway). I see what you mean about this film appearing a bit stale (although I didnt find that). Maybe it’s because all the films so far (except GOTG) have been earth based,natural powers films. This will hopefully change with the inclusion of magic in phase 3 with Dr Strange and Captain Marvel! I also enjoyed the humour from Lang’s crew but I do concede it could have been done a bit better.